Teresa Dreyfuss was appointed Superintendent/President by the Rio Hondo College Board of Trustees effective July 1, 2013. 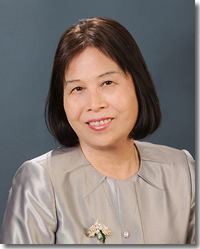 A native of Taiwan, Ms. Dreyfuss first came to the college in 1987, and previously served as Interim Superintendent/President and Vice President, Finance and Business. She has also served as Chief Financial Officer, Controller/Business Manager, Business Manager, and Senior Accountant. She has been instrumental guiding the $250 million facilities construction program, known as ‘Measure A’ which is nearing completion and which has transformed the aging hilltop campus into a modern institution including three educational centers to provide access for underserved areas of the Rio Hondo College service area. Ms. Dreyfuss holds a MBA from the University of Laverne and a Bachelor’s degree from the University of Chinese Culture, Taipei, Taiwan. She has worked as a part-time instructor at both Rio Hondo College and Los Angeles City College, teaching accounting and business classes for 10 years. She has also worked at Riverside Community College District as Director of Business. Dreyfuss serves on several boards including Workers Compensation JPA, Dental & Vision JPA, General and Product Liability JPA, Captive Insurance for Public Agencies Limited, L.A. County Fourth District Consolidated Oversight Board, Los Angeles Orange County Regional Consortia, member of Governance Council. She was a member of the Chancellor’s Office Facility Task Force and Chief Business Officials California Community College. Currently, President Dreyfuss is a member of the Soroptimist International of Whittier, and Soroptimist International of South El Monte and El Monte, Whittier Historical Society, National Association of Latino Elected and Appointed Officers, American Association of University Women. She is also Vice Chair of the City of Whittier’s Sister City Committee, Senior Advisor to the L.A. Positive Chinese Association, as well as Vice President of the Chinese Culture, University Southern California Alumni Association, and Faculty Member at the Leadership Development Program for Higher Education. As Superintendent/President, Ms. Dreyfuss is committed to ensuring that Rio Hondo College remains fiscally strong while focusing on student success.